What’s the difference in Sedan versus Not Sedan? To simplify and streamline Spiffy’s scheduling process, we’ve categorized vehicles in two distinct classifications: Sedan and Not Sedan. Sedan: Think small. Typically, 4 doors or less and 2 rows of seats or less, with a separated, enclosed trunk area. For example, sedans, coupes, and convertibles. Exceptions? Small hatchbacks. Not Sedan: Think large. Typically, 4 doors or more (rear hatches count) and 2 rows of seats or more, with an open trunk area. For example, minivans, pickup trucks, crossovers, station wagons, and SUVs. What are Spiffy’s hours of operation? We operate sunup to sundown, 7 days per week, with the exception of major holidays. What is Spiffy’s weather policy? In the event of inclement weather, such as sub-freezing temperatures, severe storms, excessive wind, rain, sleet, or hail, Spiffy will continue services in covered areas e.g. garages, parking decks, car ports, etc. If no covered areas are available, the technicians will assess the current climate, and if necessary, our scheduling team will work with you to find a more convenient time to schedule your service. What is your policy if there is a problem with my Spiffy service? Our Spiffy promise is to leave every customer satisfied with a clean and/or serviced vehicle, and if you are disappointed with your service, we want to make it right as soon as possible. Call (844) 438-7743, click the chat button below, or send an email to support@getspiffy.com within 7 days of your original appointment, and a member of our Customer Care team will promptly work with you to find the best solution, beginning with a complimentary "make-good" service. Make-good offers are valid for up to 30 days from the offer date. What is your policy about vehicle damage? If there is ever damage to your vehicle that is caused by our technician during your Spiffy appointment, we will work with you to ensure that it is taken care of. We cannot take responsibility for any maintenance issues present in your vehicle prior to a Spiffy appointment, such as jammed windows and cracked windshields. Are there any services you do not warranty? We do not warranty the Spiffy engine clean upgrade. This service uses high-pressure hot water, steam, and degreasing chemicals that can uncover pre-existing electrical issues. If you suspect engine trouble, please do not book this service. We occasionally offer headliner cleaning on a case-by-case basis and do not warranty that service due to the potential for damage. What brand of products does Spiffy use most often? Spiffy partners with Simoniz® for our cleaning and detailing products. Simoniz is the worldwide industry leader in car appearance chemicals. Additionally, all of our technicians are Simoniz Certified experts in car washing and detailing. Can Spiffy Technicians drive manual transmission? Spiffy understands that while manual transmissions are becoming less common, the love for them isn't. We will work with you to schedule your service on a technician trained on these vehicles, or will find a time convenient for you to assist in moving it. Our technicians will not attempt to drive a manual transmission unless they are trained and confident in doing so. How does Spiffy's Refer-A-Friend program work? You'll get $20 in your Spiffy account every time a friend books using your referral code. You can refer up to 5 friends, meaning you could potentially get $100 towards Spiffy services! All you have to do is enter your friend's emails here and Spiffy will send them a referral code to use when they book their service. Why are you now charging for trim/running boards? We upgraded our product from a temporary water-based protectant that washed off after the first rain to a specially formulated plastic trim restoration which we now guarantee for 3 months. How long will my Spiffy Service take? Why can’t I book my Spiffy appointment today? Our Spiffy technicians are fully booked for the day and can’t fit your appointment in. The location you’re booking from is a part of our “Spiffy Partner Pricing” program and our technicians only come to you on a specific day each week. The date you chose is a holiday. How do I know my appointment is confirmed? Spiffy will send you an email, text or in-app message depending on your preferences when your appointment is confirmed. Your Technician will arrive within a 30-minute window of your appointment time and your appointment should be completed by the promised end time. If something unexpected comes up that will slow the Technician down (oh no, this car is covered in fill in the blank), we will let you know the impact on your service timing and cost. Once an appointment is confirmed, you can cancel at no charge up to 24 hours prior to your scheduled service time. If you cancel a residential appointment within 24 hours of the scheduled start, Spiffy may apply a $15 cancellation fee to cover the costs of rerouting our Technicians. We will never charge a fee for weather-related cancellations. How do I get you my keys? Spiffy is offered as an amenity at hundreds of office parks, apartment complexes, and parking decks. If your location offers Spiffy as an amenity, feel free to give us a call, or ask your property management team about Spiffy’s key process at your location. If you are receiving an at-home service, our technicians will contact you upon arrival to retrieve your keys. For best scheduling availability, we don’t recommend requesting a specific technician. Spiffy’s scheduling process is designed as a “first come, first serve” system. Services that come in are equally distributed to technicians based on location, time, length of service, and availability. As a result, we do not accept these requests, in order to provide all of our customers with the best availability. Once your service has been completed, you will receive an email, text or in-app notification depending on your preferences to “Rate & Pay” for your service. You can then log in to your Spiffy mobile app or Spiffy website to provide feedback about your service, submit payment, and provide an electronic gratuity for your technician. Spiffy accepts eGift Cards, Apple Pay, and all major debit/credit cards: Visa, MasterCard, Discover, and American Express. For your convenience and the safety of our technicians, Spiffy specializes in cashless transactions. We do not accept cash payment nor do we carry cash onboard our vans. Why is there a charge on my credit card before my service? Don’t worry. It’s not a charge. We never charge your card until we do the work and give you 48 hours to rate and pay. If you cancel your appointment, we release the funds immediately, but it might take a couple of days for your bank to clear the hold. Does Spiffy keep a percentage of Technician tips? No, 100% of any added tip amount goes straight to your Spiffy technician! Is my stored credit card information safe? While we require you to store your credit card to pay for Spiffy services, we utilize a tokenization system that only accesses your information when it is necessary to make a payment. Your card number is encrypted and stored off-site so that you’re protected from the damage of a data breach. I see two Spiffy apps. Which one should I download? Download the Spiffy Blue app for on-board diagnostics functionality. Where do I plug in my Spiffy Blue sensor? 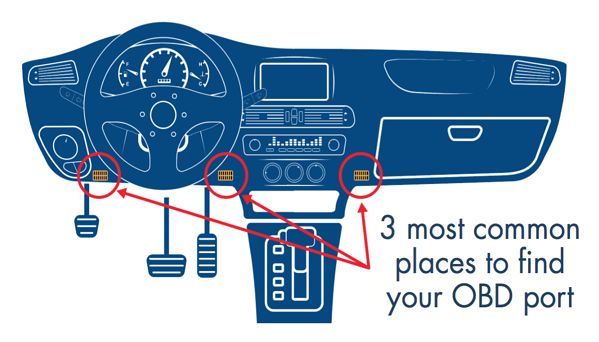 On-board diagnostics port location varies by vehicle, but most fit into one of three places. Check out our handy diagram below. If that doesn't do it, give us a call at 877-433-6840 or chat with one of our US-based Customer Care reps using the "Chat" button below. How do I connect the Spiffy Blue app to the Spiffy Blue sensor? Still have questions? Our customer care team is here to help. You can give us a call at 844-433-6840 or live chat with us by clicking the "Chat" button below. Can I use Spiffy Blue for multiple cars? You can use one Spiffy Blue sensor per car. If you purchase a sensor for each of your vehicles, you can manage them all within the Spiffy Blue app. How long can I leave Spiffy Blue plugged in? You can leave Spiffy Blue plugged in for as long as you want. It does not retrieve data without you asking by clicking Engine Diagnostics for a scan. Does Spiffy Blue track me? No, Spiffy Blue does not track your vehicle. Spiffy Blue solely reads trouble codes from your engine, and only does so when you ask it to scan. Does my car need Bluetooth? No, your car does not need Bluetooth. Your phone’s Bluetooth is all you’ll need in order to connect to the sensor. Can Spiffy Blue clear a check engine light? Yes. Based on customer feedback, the latest version of the Spiffy Blue app can clear the check engine codes. If you go to the vehicle diagnostics page, there is a "clear" button on the top. When you click it, it prompts a disclaimer and once you accept it clears the code and turns off the check engine light.